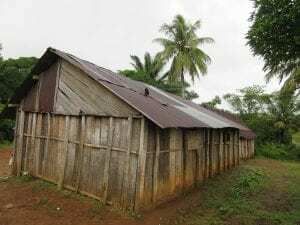 TASC Madagascar, together with our partners The Adsum Foundation, is funding the rebuilding of a secondary school near to Tanjomoha. Salohy is a remote rural village with a school in total disrepair. There is one teacher who is rarely paid and appears sporadically. 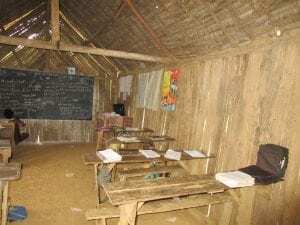 The local children are receiving almost no education. We have met and negotiated with the local government representatives with whom we worked on the school at Maromby and agreed that once the new school is open the State will provide at least two paid and trained teachers, and TASC will fund two more for a period of five years. We expect a minimum of 120 children, of all ages, to start when the school is open. The school will have four classrooms but will also have four traditional houses with kitchens for the teachers and a playground, community well, toilets and pit latrine. The plans include a small meeting room and store and a basketball court and a small Gazebo for community meetings. Salohy lies in a pasture in the woods and we have panted almost 34 hectares of trees as part of our reforestation program, so that by the time the 7 year olds starting in the school are 17, we will have a forest to harvest and replant and some work available locally. This is our second school build but Salohy is in a very rural area; we face the additional challenges of transporting and accommodating teachers, keeping a consistency in education and making sure the education is skills based as well as reading and writing. We have secured funding for all the books the children will need and, as with Maromby, we will be base-lining all the children’s education and health status so we can monitor improvements and ongoing needs over the next 5 years. If you would like to help to fund this project your support would be very welcome. For much more information on this important project click on the link below. The new well is installed at Salohy – a major improvement to the quality of life for the villagers. Click on the link below to see how it happened.